Adriano, a Knight of Rhodes, comes to Egypt in search of his nephew Armando, whom he believes may have died in battle. In fact he has married Palmide, daughter of the Sultan of Egypt and she has converted to Christianity. The furious Sultan throws everyone in jail, but all is forgiven when Armando intercedes in a plot to overthrow his father-in-law. 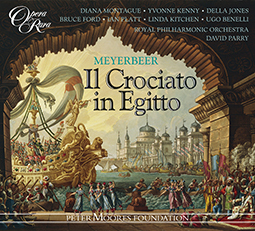 Meyerbeer’s elaborate use of vocal and orchestral forces is seminal in the development of 19th-century opera. 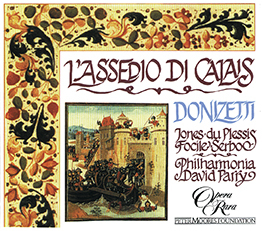 Opera Rara’s edition features all the music written for productions the composer supervised. 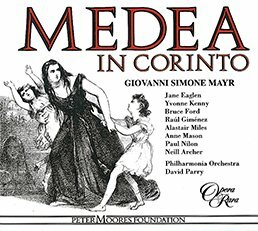 In the opera Adriano, a Knight of Rhodes, comes to Egypt in search of his nephew Armando, whom he believes may have died in battle. In fact he has married Palmide, daughter of the Sultan of Egypt and she has converted to Christianity. The furious Sultan throws everyone in jail, but all is forgiven when Armando intercedes in a plot to overthrow his father-in-law. 01 Il crociato in Egitto: Act I scena I: Chorus: Patria amata! Oh! Tu il primiero – scena II: Ma gia di Palmide gli schiavi avanzano ? 02 Il crociato in Egitto: Act I scena II: Aria: I doni d’Elmireno – scena III: Il Soldano – Prostratevi ? 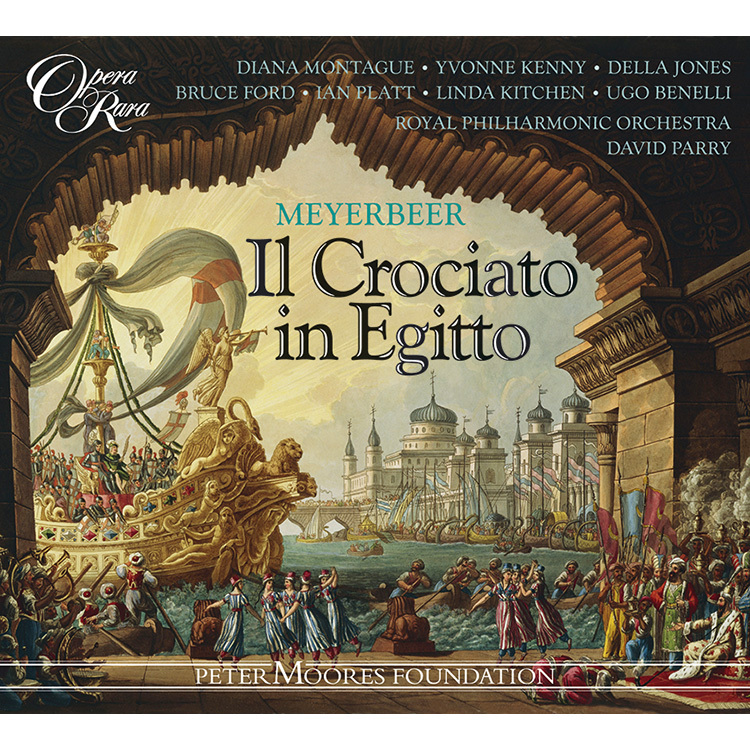 23 Il crociato in Egitto: Act I scena XI: Recitative: Oh! Come tutto intorno – scena XII: Vieni, Mirva gentil ? 24 Il crociato in Egitto: Act I scena XII: Armando d’Orville! 27 Il crociato in Egitto: Act I scena XIV: Recitative: Adriano! Egli stesso! 33 Il crociato in Egitto: Act II scena I: Recitative: Udiste – raccogliete – scena II: Osmino! – scena III: Miseri noi! 34 Il crociato in Egitto: Act II scena IV: Aria: Ove, incauta, m’inoltro? 40 Il crociato in Egitto: Act II scena VII: Ma, ciel! – S’ei mai peri! – – scena VIII: Lo vedi? Non tel dissi? 44 Il crociato in Egitto: Act II scena IX: Recitative: Di natura, e d’amista teneri moti – scena X: Il mio nipote! – scena XI: Sventurato! 47 Il crociato in Egitto: Act II scena XIII: In sen del nostro – scena XIV: Cielo! 49 Il crociato in Egitto: Act II scena XV: Quintet: Che miro? Oh cielo! 57 Il crociato in Egitto: Act II scena XIX: Recitative: Or perduto e Aladino? 63 Il crociato in Egitto: Act II scena XXI: Aria: Ah! Che fate? 83 Il crociato in Egitto: Appendix: Act II: Padre! Sposo/a! Caro/a! In an exhibition to the coast of Egypt, which took place in the Sixth Crusade, in the neighbourhood of Damietta, a band of the Knights of Rhodes, commanded by Esmengarde de Beaumont, was surprised, betrayed, and after a most heroic resistance overpowered, by the superior numbers of the enemy. Armand d’Orville, a young Knight of Provence, was one of this valiant band. Fainting from loss of blood, he had remained among the slain. He returned to himself; night came on, and he saw no other means of escaping from the disgrace of slavery, than by concealing himself in the spoils of an Egyptian warrior who had fallen on the field. He hoped, by mingling with the enemy to discover their plans, and to find a favourable moment for escape. Armand, under the assumed name of Elmireno, found an opportunity of signalising his valour, and of saving the life of Aladin, Sultan of Damietta. The supposed young soldier of fortune, by means of his superior valour and gentle manners, won the affections of the Sultan, who became his friend, and received him into the bosom of his family. The Sultan had a daughter named Palmide, who was regarded as the flower of the Egyptian maidens. She saw the supposed Elmireno, and a mutual passion was the consequence. Afar from his country, with scarcely a hope of ever returning to it again, young, and of an ardent mind, Armand forget himself, his duties, the faith he had plighted to Felicia, a noble maiden of Provence, and yielded to the love of Palmide. He instructed her by stealth in the mysteries of his faith; they were secretly united, and the product of this union is a son. But the call of honour, the love of country, and sense of a dereliction of duty, were ever present to his mind, and threw a gloom over his happiness. Aladin observed the mutual attachment of Armand and his daughter, and only waited the return of Elmireno from a glorious campaign, in order to unite their hands. Meanwhile, overtures were made to the Sultan by the Knights of Rhodes, for an exchange of prisoners: terms of peace were also offered, and an embassy from them arrived at Damietta. The action commences at the arrival of this embassy.